What are the odds that Sam and Dean are at odds? Again? Don't worry, it's not like we really didn't see this one coming. Dean had his Purgatory issues and a vampire friend, Sam didn't look for his brother and tried to live the normal life, they get upset with each other pretty much every season and, well, brothers just don't agree on every single thing. Sure, you might think that "Citizen Fang" was just another rehash of the Winchester boys arguing with each other, but with this being Supernatural Season Eight, the disagreement with each other feels like it falls into the brothers' questions about their roles in life beyond the obvious and long standing job of hunting things and saving people. The truth is that Sam and Dean have gone through a lot both physically and emotionally, especially compared to us viewers or even many of the other hunters that do similar work. For the most part, Dean's been steeped in the monster killing business and it's pretty much been all he's ever known how to do, aside from picking up pretty girls and power eating pieces of pie. Sam on the other hand, did have that taste at the normal life with his short lived career at college and his affinity for having a less black and white approach to eliminating the creatures of the night. 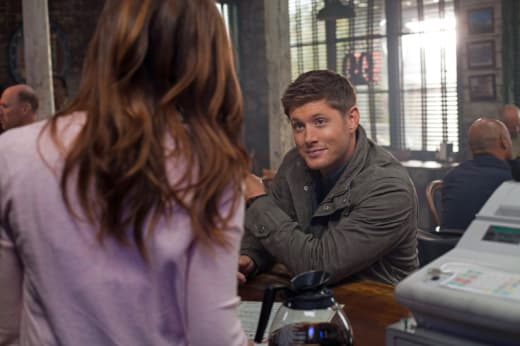 Which in reality, after the journey the two have taken, makes for an interesting turn of events when Dean is sent deep into bloodthirsty Purgatory amping back up his ability to slay and Sam falls back in love (even if I'm still not feeling it) and right into TV nights and meeting the parents. In a lot of ways, it feels as if the show has come full circle and reignited the old school vibe, with new school flavor. I can certainly say that for a mid-season finale, I was hoping we would get more of Kevin, Crowley and the tablets, but I understand that really thrusting Sam and Dean's time off back into their faces will only increase the problems and dangers they'll have to face when the time does come to focus back on the larger mythology. Of course, all you really want is for the brothers to get along and get past their issues. I was actually glad that Sam genuinely tried to hear Dean out in respect to Benny, and I don't blame him for connecting what seemed like obvious dots when it came to the murder. And it kills me when Dean pretty much tells Sam that Benny was more of a brother to him. Sure, I get his frustrations and I understand that he's defensive when Benny is accused, but he's got to know that hurts his brother. Really, these two need to find a way to trust each other and remember that they are brothers, brothers who have both made mistakes, and should be finding ways to cut the crap. Sam continued to have his flashbacks that still felt far too dreamlike and while I find them to be not really entertaining in the grand scheme, was intrigued when Sam got the present day text from Amelia. Okay, so it wasn't really her, but she did show up at the very end and acknowledged him, so that means he wasn't dreaming, right? I'm glad she's finally here, but I can only hope that the rest of her story won't feel as bland as her past relationship with Sam. The stakes need to be raised for these two. Similarly, Dean still has Benny and still trusts Benny, allowing them to take down another vampire and save the day. Yet, it really didn't matter because the whole situation was flawed from the start for them. But, it was the definite blast from the past reintroduction of crazy Martin from the season five episode "Sam, Interrupted" that really threw reality and trust for a loop. What can you believe anymore? I guess you can count on something Dean said back in season one's "The Benders" about people being crazy with Martin turning what can only be seen as evil. Which was rather interesting in not only getting a creepy feeling from him, but where you wanted Benny to save the day. It was a great flip on that whole situation and I'm glad that we'll get to see more of Benny in the future. But will Dean have to deal with Benny because of it and will Sam ever understand even if he did hang up before hearing the whole story? There really was a lot to digest in terms of character and it makes me wonder what the end game of the show might be (not that I want it to end). Is the destiny of Sam and Dean to fight monsters until the last gunshot? I'm curious as to how the boys will reconilce their differences and be able to come together. This was another decent episode for Supernatural, but I'm really hoping that when the show returns January 16 that Sam and Dean get a grip on working as a team, remembering that they are family, and figuring out how to close the gates of Hell. What did you think of the episode? What do you want to see happen when the show returns? Sound off below!